From desktops, laptops and tablets to game consoles and other CE devices, the Universal Serial Bus has been the industry standard for cable and connection interfaces for about 20 years. It has been speculated that USB-C, developed by the USB Implementers Forum, would soon become the successor to the USB standard. Intel announced during Computex in Taiwan last week that Thunderbolt 3 will embrace USB-C functionality, and initially offer data transfer rates twice as fast as Thunderbolt 2 and four times that of USB 3.1. Teaming the two could be a game-changer. The first iteration of Thunderbolt appeared in 2011, jointly developed by Intel and Apple. 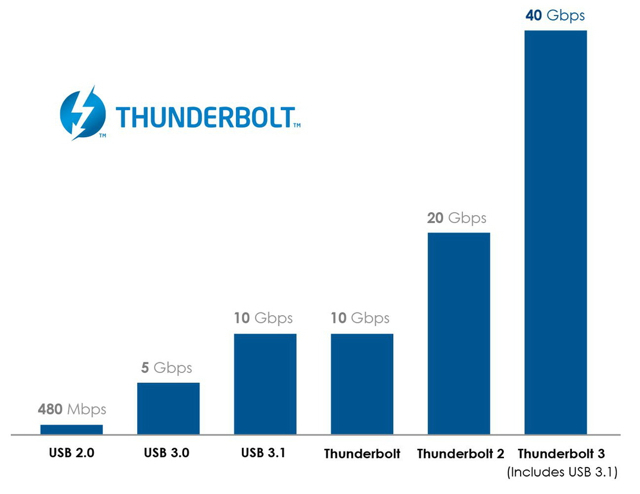 Despite superior speed and the ability to connect multiple peripherals with a single connector, Thunderbolt and Thunderbolt 2 (2013) were slow to be adopted, due in large part to excessive cost and lack of compatible products. However, the consolidation of Thunderbolt 3 and USB-C could change that. In addition to its speed (according to Intel, Thunderbolt 3 can transfer a 4K movie in 30 seconds), USB-C is reversible, allows for bi-directional power, and allows for thinner form factors due to its small size. Thunderbolt 3 supports DisplayPort, HDMI, USB and VGA. While Apple’s MacBook and Google’s most recent Chromebook Pixel feature USB-C ports, Computex additionally featured an array of other compatible products. “Thunderbolt 3 comes with an impressive spec sheet: transfer speeds of 40Gbps and the ability to connect two 4K 60Hz displays sounds like strange voodoo magic in an age where many, many people haven’t yet upgraded from USB 2.0 machines,” reports Wired. And not all USB-C devices — including the MacBook and Chromebook Pixel — will be immediately compatible with Thunderbolt 3, but “having a universal, underlying port and cable designs will make Thunderbolt that much easier for PC manufacturers to embrace,” notes Wired. For more information and tech specs, visit Intel’s recent announcement regarding Thunderbolt 3 and USB-C.